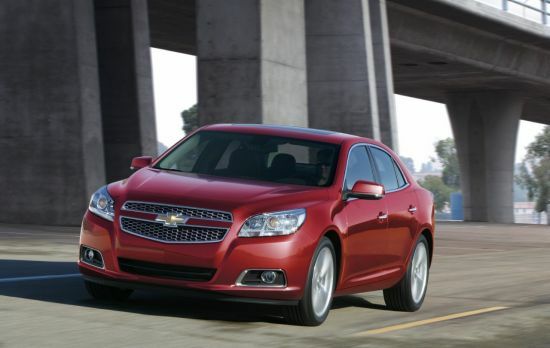 The 2013 Malibu Turbo is the new midsize sedan that has got a Chevrolet Spirit. The exterior is stylish and the interior is comfortable. The safety features are enhanced and the engine is capable of giving a powerful performance. Let’s have a look at some of its spectacular features. The interior is comfortable and spacious. This four door , five passenger vehicle is equipped with eight-way power driver seat with power lumbar, tilting and telescoping steering column with steering wheel controls, Leather-appointed seats and Heated front seats. The Dual-zone automatic climate control keeps the temperature inside the car moderate and the Ice-blue ambient lighting gives the interior a glowing look. The 2013 Malibu is powered by all-new 2.0L turbocharged engine that can deliver an output power of 259-horsepower. It can accelerate from 0 to 60 mph in 6.3 seconds and a top speed of 155 mph is achieved. An impressive EPA rating of of 21 mpg is achieved in the city and 30 mpg on the highway. An outstanding performance is attained with dual-overhead camshafts and continuously variable valve timing with a direct injection engine. The Hydra-Matic 6T70 six-speed automatic transmission, with TAPShift control is capable of giving fastest acceleration. It will be available this fall as both a mid-level LT model with a suggested retail price of $27,710 and as an LTZ model with a suggested retail price of $30,925. So, get ready to cruise in the new car, the 2013 Malibu Turbo and experience the power of driving. Buying A Lexus? These Ingenious Ideas Will Get You Cheaper Insurance!